After six consecutive years of positive returns, in 2018 the UK stock market declined by 9.5%, while the global stock markets declined by about 3%. A careful observer might argue that a ‘correction’ was long overdue, given the generous return of prior years. However, that hasn’t silenced the media furore about investment markets in the final quarter of the year. Some pundits have even suggested that decline is a sign of things to come. Some attribute this to Brexit. Others blamed Trump’s trade wars. This sort of pontification has little real evidential basis. 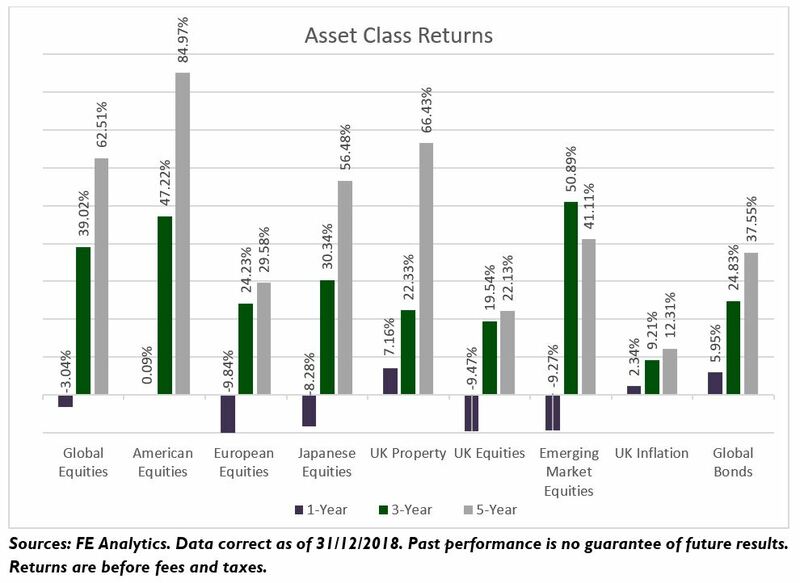 Accordingly, we think it’s worth reviewing the performance of major asset classes to provide some long-term perspective on returns that we hope every long-term investor will find useful. The reality is that the very nature of the stock markets means that we can’t and shouldn’t expect returns to be positive every single year. Indeed, that has never been the case. Historical data shows that, over the last 100 years, UK Equity has delivered negative annual returns around one in four to five calendar years. This is also true for US and global stock markets. 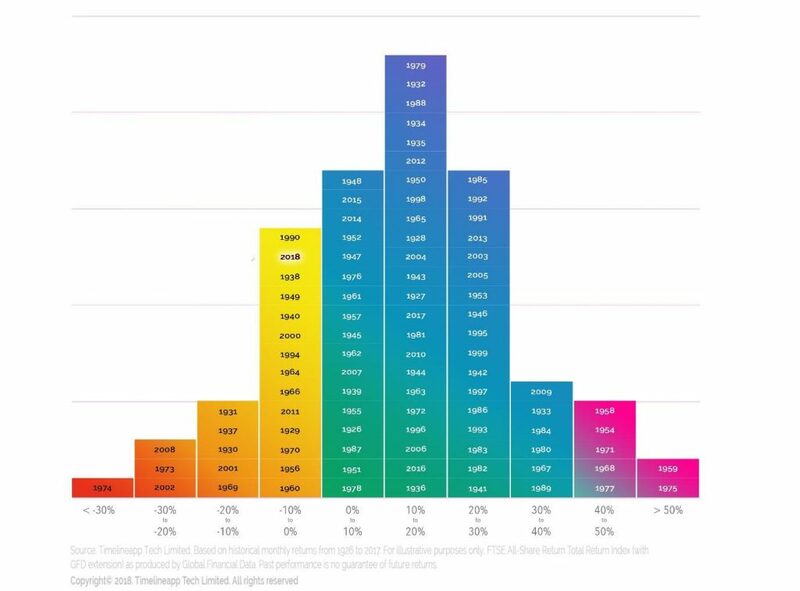 The chart below is a histogram showing the range of annual returns since 1900 in bands of 10%. Of the 119 years shown on this chart, UK stock markets delivered a negative return in 23 calendar years. Most of those 23 years of negative returns saw the equity markets falling by up to 20%. There are a few years with losses of more than 20% but alas, there are three times as many years with gains of more than 20% a year. Simply put, the odds of exceptionally high returns are significantly greater than the odds of an exceptionally low return in any one year. Cold hard data shows that, contrary to what you might have read in the news media recently, there is nothing unusual about investment performance in the past year. And last year’s performance offers no guide as to what we should expect in the coming year. Not only is this latest decline well within our range of expectations in terms of frequency, but the magnitude of the loss is also well within historical bounds. To provide a broader perspective, the chart below provides a summary of the performance and the volatility of main asset classes over the last 1, 3 and 5 years. As we see in the figure above, most asset classes have delivered positive returns above inflation over our 3 and 5-year observation periods (which include 2018). As humans, we tend to extrapolate unknown future events from recent experiences, rather than drawing from potentially more meaningful experiences that occurred less recently. This is what psychologists refer to as Recency Bias. As always, clients will have concerns about certain political and geopolitical events. 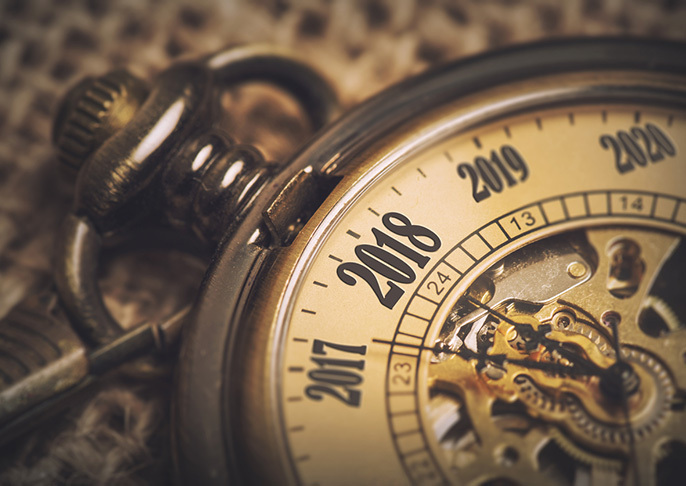 At the start of 2019, those sources of concern are likely to be Brexit and the Sino-US trade war, the latter of which is having a drag on global growth. As a result, we often get asked by clients whether they need to change their investment strategies in the wake of these seemingly catastrophic issues. As always, our advice is to ignore the hysteria and to alter your investment strategy in the event that your own personal circumstances have changed. Once we put a financial plan in place with a client, we rarely ever recommend changing the portfolio so long as your long-term goals haven’t changed. Over time, we’ve found that the more often investors change their portfolios in response to the market, the worse their long-term results are. Our investment philosophy is one driven by goals and planning, not erratic market movements. The vast majority of successful investors achieve their goals by acting consistently in accordance with a predetermined plan; failed investors, on the other hand, do not. Unlike many in the investment industry, we don’t pretend to know what the capital markets will do in the future. In reality, nobody does, even though some may refuse to admit it. What we do know, based on extensive historical data is that, over the long term, the odds of positive return are significant.